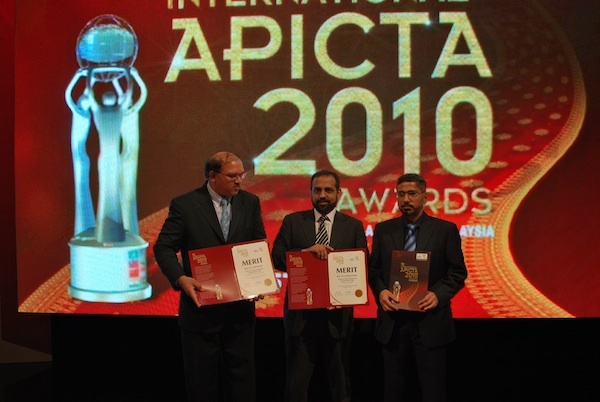 The team from the Center for Advanced Research in Engineering (CARE) swept the Silver at the Asia Pacific ICT Awards (APICTA) in Kuala Lumpur on October 15, 2010. The team comprising Dr Shoab Ahmed Khan, Dr. Hammad Ahmed Khan and Dr. Zaheer Ahmed went to APICTA with a focus in mind – to show the world what kind of technology innovation is taking place in Pakistan – and they did. The CARE team won the Merit Award in three categories – Communication, Security and E-Government. Contratulations to Shoab, Hammad and Zaheer and to the many in the CARE team in home base who worked through many days and nights to make this happen. We are extremely proud of you.